Visit Frameless Glass Curtains at the award-winning Grand Designs Live Exhibition at London Excel 4-12th May 2019. Grand Designs Live is based on the well-known Channel 4 Series. This huge event is for anyone interested in self-building, renovation projects, interior design and home improvements. Innovative frameless doors and glazing at Grand Designs Live. At Grand Designs Live you will see a substantial number of home improvement products covering windows, doors, sliding and bifolding doors. Only FGC offers a collection of unique products designed around the frameless concept, making the most of glass with minimal aluminium framing. Best of all, every one of our products at Grand Designs Live helps you create a dream home extension or home improvement, making the most of the latest in contemporary doors and glazing. We have a limited allocation of discounted tickets available, simply follow this link to the Grand Designs website and save £5 per person on the standard entry fee. Frameless double glazed doors offering more features than other aluminium, PVCu or timber sliding folding doors. Frameless internal room dividers, perfect for separating a conservatory or creating a glass partition in your home. A selection of all glass interior doors, ideal for inside the home, bathrooms or hallways. Elegant frameless glass balustrades for any balcony, staircase or outside for your patio area. Rooflights flooding your room with light from above, including the latest walk-on glass. The latest in minimalist slimline sliding patio doors, creating impressive sliding glass walls. 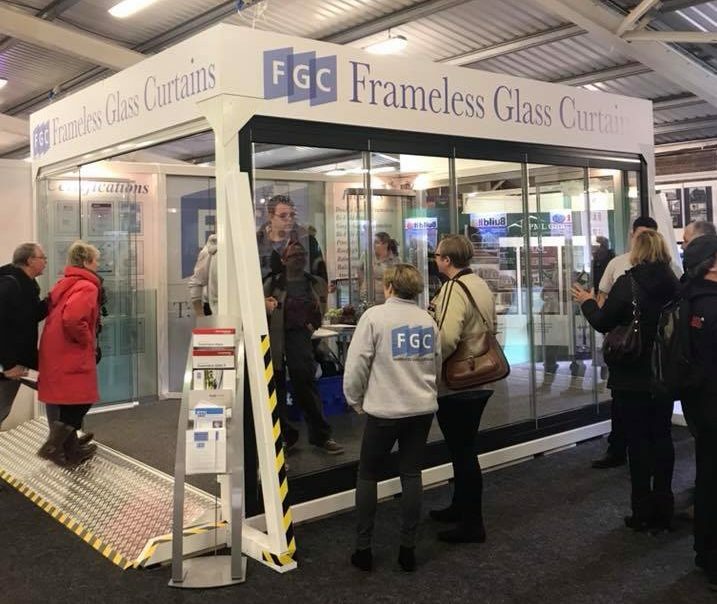 When you visit all the different windows and doors at Grand Designs Live, then come see Frameless Glass Curtains and you’ll instantly see how our products are entirely different. Above all, our complete exhibition stand offers you everything you need to create your own Grand Designs whatever your size or style of home. Outstanding thermal performance, security and weather performance. Lower thresholds than other sliding or folding doors. Huge choice of colours options to personalise your glazing.